Household technology has developed in leaps and bounds over the last several decades. From flip phones to smartphones, bulky home computers to sleek laptops, even basic thermostats or refrigerators to smart household appliances, technology’s role in our everyday lives continues to grow each year. When it comes to daily oral hygiene, however, many Americans are still using the traditional, manual toothbrush. If you are considering finally upgrading from a manual to an electric toothbrush, you will want to read the pros and cons from a dentist below. According to the American Dental Association, both manual and electric toothbrushes are effective tools to keep your teeth clean from harmful plaque buildup. However, the human hand just cannot move as fast as an electric toothbrush. On average, a person can perform around 300 strokes per minute when brushing by hand. An electric toothbrush, on the other hand, can oscillate thousands – or even tens of thousands – of time per minute! All those extra strokes add up: an electric toothbrush can more thoroughly remove harmful plaque from your teeth in less time than a traditional toothbrush, reducing the likelihood that tooth decay or gum disease will develop. Regardless of whether you are using a manual or electric toothbrush to keep your teeth clean, dental professionals recommend brushing at least twice daily for a full two minutes each time. However, most people do not count for 120 seconds while they are brushing their teeth – instead, their mind may be contemplating a conversation from earlier in the day, the errands that need to be completed tomorrow, or just be off in a completely different world. As a result, many individuals do not brush for the full recommended two minutes. Here is where technology can help: many modern electric toothbrushes have programmed timers to alert users when they have reached the two-minute mark when brushing. Some even beep to alert users when they should switch the brush from one side of the mouth to the other for a complete and balanced cleaning. For those who find their mind drifting away when brushing their teeth, electric toothbrushes can help support good oral hygiene. Electric toothbrushes are easier to use for those who struggle to grip a small toothbrush. Because they are slightly bigger in size and rotate automatically, electric toothbrushes can help senior citizens who have arthritis in their hands or wrists keep their teeth clean long into their golden years. At the other end of the age spectrum, electric toothbrushes can encourage children to practice good oral health habits by making brushing their teeth seem more fun and less of a bedtime chore. Today’s brushes come in all shapes, colors and even characters. If your young son or daughter consistently tries to avoid brushing their teeth before bed, consider letting them choose their own electric toothbrush. At the end of the day, the most important factor in keeping your teeth clean is practicing good oral hygiene by brushing and flossing twice daily. 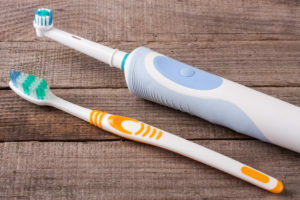 However, electric toothbrushes do have some unique benefits compared to manual brushes that are worth considering the next time you are shopping for a new brush. A graduate of the UCLA School of Dentistry, Dr. Nelson Y. Howard provides comprehensive dental services to families and individuals in San Marcos and San Diego. Dr. Howard was the first dentist in North San Diego County to be an accredited member of the American Academy of Cosmetic Dentistry and is the president and founder of the West Coast Society for Cosmetic Dentistry. If you want to learn more about preventive dentistry and how to maintain good oral health, visit his website today or call the office at 858-451-0550.